These are uncertain times. There has been a power void since the coup. Everyone strives to gain the support of the four most powerful and influential figures in the city. News travels fast, and no guild wants to become infamous...unless of course they can profit from it! 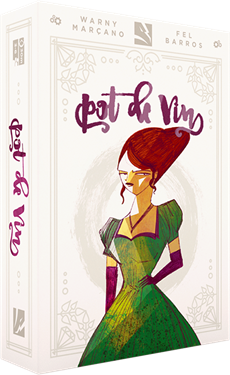 Pot-de-Vin, an upcoming trick-taking game from ThunderGryph Games is about knowing when to be cunning, when to be prudent and when to strike. The goal of Pot de Vin is to collect sets of different Guild symbols by winning rounds and claiming the cards of your opponents. Gather the right amount of symbols to gain the most points, but be careful, if you gather too many you will get negative points unless of course you gather them all. Use wisely your Jokers that can be added to a Guild of your choice to increase your guild symbols and the bribe gems that you can use to pass the turn. You can pre-order the game on ThunderGryph Games website.